Magewell has unveiled the new Pro Convert AIO RX hardware-based NDI decoder, adding to its portfolio of devices for bridging traditional video equipment with IP-based workflows. 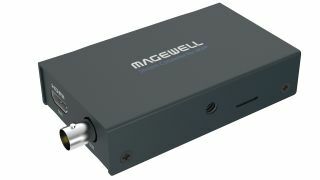 Magewell has introduced the Pro Convert SDI 4K Plus for bringing traditional video signals into live, IP-based broadcast and AV infrastructures. Magewell's Pro Convert HDMI 4K Plus and Magewell Bridge for NDI are designed to provide easy and reliable onramps to connect traditional video sources into NDI-compatible media networks.